On November 22, 1963, President Kennedy’s assassination fundamentally altered the American political landscape, neutralizing JFK’s peace initiatives in Europe, Southeast Asia and Cuba. Furthermore, LBJ was manipulated into pursuing the open-ended Vietnam commitment JFK had studiously avoided. In past discussion of “Eddie the Friendly Spook,” we have characterized him as “the Obverse Oswald.” With their exercise of “Technocratic Fascism,” “Team Snowden” is destroying American democracy as definitively and effectively as the bullets in Dealy Plaza did on 11/22/1963. Supplementing and summing up the exhaustive FTR series on “The Eddie the Friendly Spook” series, this program sets forth the Snowden “psy-op” and the high-profile hacks against the background of Lee Harvey Oswald, the U.S. spy infiltrated into the Soviet Union and then into leftist organizations in the United States, Oswald was framed for JFK’s assassination and then killed before he could defend himself. Whereas Oswald was portrayed as a villain, Eddie the Friendly Spook’s operation is the obverse, with Snowden portrayed as a hero, while decamping first to China and then to Russia. For purposes of convenience and continuity, we begin this description by reviewing and synopsizing information indicating that Russia has been framed for the “Shadow Brokers” alleged hack of the NSA, much as it appears to have been framed for the DNC hack. Indeed, with both the DNC hack and the “Shadow Brokers” non-hack of the NSA, the evidence points increasingly toward “Team Snowden” and Eddie the Friendly Spook himself. 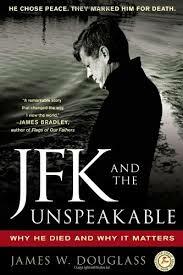 The vast bulk of the program material consists of a reading of an excerpt from JFK and the Unspeakable: Why He Died and Why It Matters by James Douglass. As we have seen in so many programs, JFK was moving to drastically reduce Cold War tensions by implementing a number of things, including withdrawing the U.S. from Vietnam  and normalizing relations  with Cuba. Continuing a pattern of subverting  White House attempts at achieving detente with the former Soviet Union, dominant elements of CIA “painted Oswald red.” A major feature of that successful effort was a visit to Mexico City by Oswald, and/or someone pretending to be Oswald, where the patsy-to-be visited the Cuban consulate and Soviet embassy, ostensibly attempting to obtain entry documents to both countries. Noteworthy, here, is “Oswald’s” meeting with Valery Kostikov, a KGB assassination expert at the Soviet embassy. This liaison appears to have played into the scenario presented in FTR #925 , in which Oswald was linked by elements of the W.A.C.C.F.L. with the assassination of Ukrainian fascist leader Stephan Bandera. We observe that the orgiastic media propaganda blaming Russia for the DNC hack and the Shadow Brokers “non-hack” (with its ludicrous Boris-and-Natasha-like broken English), on top of the propaganda excoriating Russia about Ukraine and Syria, places Hillary Clinton in a similar position as LBJ. It will be extremely difficult for her to avoid being sucked in to the New Cold War. We note again, with great emphasis, that the operation fronted for by “the Obverse Oswald” (Snowden) destroyed the Obama/Clinton State Department’s re-boot with Russia as thoroughly as the JFK assassination, with its “painting of Oswald Red” destroyed JFK’s attempts at establishing detente with the U.S.S.R.
Review of Pierre Omidyar’s role  in the Maidan coup in Ukraine, which saw the return to power of the successors to Bandera’s OUN/B. Review of Snowden’s placing of his files with Omidyar and Nazi fellow-traveler Glenn Greenwald . 2. The vast bulk of the program material consists of a reading of an excerpt from JFK and the Unspeakable: Why He Died and Why It Matters by James Douglass. As we have seen in so many programs, JFK was moving to drastically reduce Cold War tensions by implementing a number of things, including withdrawing the U.S. from Vietnam  and normalizing relations  with Cuba. Noteworthy, here, is “Oswald’s” meeting with Valery Kostikov, a KGB assassination expert at the Soviet embassy. This liaison appears to have played into the scenario presented in FTR #925 , in which Oswald was linked by elements of the W.A.C.C.F.L. with the assassination of Ukrainian fascist leader Stephan Bandera. Allegedly committed by Bogdan Stashynsky, the killing of Bandera occurred on the same day as Oswald’s defection to the former Soviet Union. W.A.C.C.F.L.-linked elements distributed the disinformation that Oswald had been trained by the KGB along with Stashynsky. We noted in FTR #925  that the head of a broken key to Bandera’s apartment was still in the lock two years later, as Stashynsky was on trial! Furthermore, Stashynsky still had the broken-off shaft of the key in his possession, linking him to a capital crime and opening him up to “termination with extreme prejudice” by the KGB, had he actually been in there employ. . . . . According to the Warren Report, Lee Harvey Oswald was in Mexico City from September 27 to October 2, 1963, and visited both the Cuban and Soviet Consulates. This is the point at which the person Lee Harvey Oswald begins to disappear down a black hole. As a Cold War actor who took on assigned roles, the person Oswald was never easy to see. In Mexico City, the real Oswald almost drops out of sight, but with his absence covered by impersonators and the CIA’s smoke and mirrors. The CIA’s Mexico City Station kept a close watch on activities at the Cuban and Soviet Consulates. Agents had set up hidden observation posts across the street that took pictures of visitors to the two sites. The Agency had also wiretapped the phones at both the Cuban And Soviet facilities. Thus, the CIA had front-row surveillance seats for what transpired there. The Agency’s reports on what were supposedly Lee Harvey Oswald’s visits and phone calls to the two consulates inadvertently revealed more about the CIA than they ever did about Oswald. The Mexico City story being created about Oswald in carefully preserved documents was written with such dexterity in some places, and with such clumsiness in others, that it eventually drew more attention to itself and its authors than it did to its fictionalized subject. As a result, what Oswald himself really did in Mexico City is in fact less certain today than what the CIA did in his name. The documents containing this self-revelation have finally been declassified and made available to the available to the American public during the past decade as a result of the JFK Records Act passed by Congress in 1992. However, only a few dedicated researchers of the Kennedy assassination have studied these materials and have understood their implications. On October 9, 1963, CIA headquarters received a cable from its Mexico City Station about an October 1 phone call to the Soviet Consulate that had been wiretapped, taped, transcribed, and translated from Russian into English. The call came from “an American male who spoke broken Russian” and who “said his name [was] Lee Oswald.” The man who said he was Oswald stated that he had been at the Soviet Embassy on September 28, when he spoke with a consul he believed was Valery Vladimirovich Kostikov. He asked “if there [was] anything new re telegram to Washington.” The Soviet guard who answered the phone said nothing had been received yet, but the request had been sent. He then hung up. What one is confronted with in the October 9 cable is an apparently damning connection between Oswald and a KGB assassination expert, but a connection made by a man impersonating Oswald. It is the beginning of a two-tracks Mexico City story. On one track is the CIA’s attempt to document Oswald’s complicity with the Soviet Union and Cuba in the assassination of John F. Kennedy. On the other track is the recurring evidence within the same documents of a fraudulent Oswald at work. Given the notoriety of Valery Kostikov in U.S. intelligence circles, it is remarkable that when CIA headquarters cabled the State Department, the FBI, and the Navy on October 10 to relay the wiretapped information it had received on Oswald the day before, the cable made no reference to his specific connection with Kostikov. Kostikov was not even mentioned. This would be like a 2001 intelligence report on a suspected terrorist neglecting to mention that he had just met with Osama bin Laden. CIA headquarters was keeping its knowledge of the Oswald-Kostikov connection close to its vest. The CIA’s silence regarding Kostikov was maintained just long enough for Oswald to be moved quietly (without being placed on the FBI’s Security Index) into a position overlooking Dealey Plaza on November 22. After the assassination, the CIA used its dormant Mexico City documents to link the accused assassin Oswald with the KGB ‘s Kostikov. On November 25, 1863, Richard Helms sent a memorandum to J. Edgar Hoover that marshaled the CIA’s phone-tapped evidence suggesting that Oswald had received not only Soviet but also Cuban government support in assassinating Kennedy. Attached to the Helms memorandum were transcripts for the audiotapes of seven calls to the Soviet Mexico City embassy attributed to Oswald. Two of them stood out. One was the October 1 call in which “Oswald” identified Kostikov as the Soviet consul he had met with on September 28. In the other outstanding call, reportedly made on September 28, the same man, speaking from the Cuban Consulate, made reference to his having just been at the Soviet Embassy. To understand this revealing call, we need to put it in the context of what may or may not have been the real Oswald’s shuttles between the Cuban and Soviet Consulates during his first two days in Mexico City, September 27 and 28. Given Lee Harvey Oswald’s willingness to take on intelligence roles, the primary question concerning his visits to the Cuban and Soviet Consulates is not: Was it really he? Whether it was Oswald or someone using his name, the “he” was still an actor following a script. If the actor was himself, from his limited standpoint his role’s purpose would have been, as in New Orleans, to discredit the Fair Play for Cuba Committee in a minor Cold war battle. According to an FBI memorandum dated September 18, 1963, discovered by the Church Committee, the CIA advised the FBI two days earlier that the “Agency is giving some consideration to countering the activities of [the FPCC] in foreign countries.” Nine days later in Mexico City, “Oswald” visited the Cuban and Soviet Consulates displaying his FPCC credentials and seeking visas to both those communist countries. Whether it was Oswald or not who was playing out another FPCC-discrediting role in his name, the more basic question is: What was the Mexico City scenario’s purpose in the larger script written for the President’s murder? It is this question of ultimate purpose that the CIA’s Mexico City surveillance tapes will assist us in answering, after we first consider the September 27-28 visits to the consulates that were acted in the name of Oswald. According to Silvia Duran, the Cuban Consulate’s Mexican employee who spoke with Oswald, he (or an impostor) visited their consulate three times on Friday, September 27. At his 11:00 A.M. visit Oswald applied for a Cuban transit visa for a trip to the Soviet Union. Duran was a little suspicious of Oswald. She felt the American was too eager in displaying his leftist credentials: membership cards in the Fair Play for Cuba Committee and the American Communist Party, old Soviet documents, a newspaper clipping on his arrest in New Orleans, a photo of Oswald being escorted by a policeman on each arm that Duran thought looked Phony. Duran also knew that belonging to the Communist Party was illegal in Mexico in 1963. For that reason, a Communist would normally travel in the country with only a passport. Yet here was Oswald documented in a way that invited his arrest. Duran told Oswald he lacked the photographs he needed for his visa application. She also said he would first need permission to visit the Soviet Union before he could be issued a transit visa for Cuba. Visibly upset, Oswald departed, but returned to the consulate an hour later with his visa photos. In the late afternoon, Oswald returned again to the Cuban Consulate, insisting this time to Silvia Duran that he be granted a Cuban visa at once. He claimed that the Soviet Consulate had just assured him he would be given a Soviet visa. Duran checked by phone with the Soviets and learned otherwise. She told Oswald, who then flew into a rage. He ranted at Duran, then at the Cuban consul, Eusebio Azcue, who had stepped out of his office into the commotion. Oswald raged in response to Azcue’s explanation of the visa procedure. Azcue yelled back at him. Oswald called Azcue and Duran mere “bureaucrats.” Then, as Silvia Duran recalled in 1978 to the House Select Committee on Assassinations (HSCA), Azcue went to the door, opened it, and asked Oswald to leave. The extraordinary episode had, perhaps as intended, left an indelible impression on Duran and Azcue. Oswald listened with growing exasperation. “When I had finished speaking,” Nechiporenko recalled, “he slowly leaned forward and, barely able to restrain himself, practically shouted in my face, ‘This won’t do for me? This is not my case? For me, it’s all going to end in tragedy!” Nechiporenko showed the unruly American out of the compound. Oswald returned to the Soviet Embassy the next morning. He renewed his request for a quick visa to the U.S.S.R., this time to Valery Kostikov (this being their September 28 meeting) and Soviet consul Pavel Yatskov. Oswald became even more agitated than he had been the day before, referring to FBI surveillance and persecution. He took a revolver from his jacket pocket, placed it on a table, and said, “See? This is what I must now carry to protect my life.” The Soviet officials carefully took the gun and removed its bullets. They told Oswald once again they could not give him a quick visa. They offered him instead the necessary forms to be filled out. Oswald didn’t take them. Oleg Nechiporenko joined the three men as their conversation was ending. For the second day in a row, he accompanied a depressed Oswald to the gate of the embassy, this time with Oswald’s returned revolver and its loose bullets stuck back in his jacket pocket. Nechiporenko says that he, Kostikov, and Yatskov then immediately prepared a report on Oswald’s two embassy visits that they cabled to Moscow Center. Oswald’s three visits to the Cuban Consulate on September 27, and his two visits to the Soviet Embassy on September 28 phone transcript sent by Richard Helms to J. Edgar Hoover. The CIA’s transcript states that the Saturday, September 28, call came from the Cuban Consulate. The first speaker is identified as Silvia Duran. However, Silvia Duran has insisted repeatedly over the years, first, that the Cuban Embassy was closed to the public on Saturdays, and second, that she never took part in such a call. “Duran” is said to be phoning the Soviet Consulate. Oleg Nechiporenko denies in turn that this call occurred. He says it was impossible because the Soviet switchboard was closed. What is the purpose behind this strange, counterfeit dialogue? In addition, Oswald (or an impostor) was applying for Cuban and Soviet visas, which could be used as evidence of his attempting to gain asylum in Communist countries. The Mexico City scenario had laid the foundation for blaming the president’s upcoming murder on Cuba and the U.S.S.R., thereby providing the rationale in its aftermath for an invasion of Cuba and a possible nuclear attack on Russia. Lyndon Johnson’s CIA and FBI briefings left him with two unpalatable interpretations of Mexico City. According to the CIA, Oswald was part of a Cuban-Soviet assassination plot that was revealed by the audio-visual materials garnered by its surveillance techniques. According to Hoover, Oswald had been impersonated in Mexico City, as shown by a more critical examination of the same CIA materials. Hoover left it to Johnson to draw his own conclusions as to who was responsible for that impersonation. The CIA’s case scapegoated Cuba and U.S.S.R. through Oswald for the president’s assassination and steered the United states toward an invasion of Cuba and a nuclear attack on the U.S.S.R. However, LBJ did not want to begin and end his presidency with a global war. Hoover’s view suggested CIA complicity in the assassination. Even assuming for the moment that Johnson himself was innocent of any foreknowledge or involvement in the plot, nevertheless for the new president to confront the CIA over Kennedy’s murder, in a war within the U.S. government, would have been at least as frightening for him as an international crisis. One must give the CIA (and the assassination sponsors that were even further in the shadows) their due for having devised and executed a brilliant setup. They had played out a scenario to Kennedy’s death in Dallas that pressured other government authorities to choose among three major options: a war of vengeance against Cuba and the Soviet Union based on the CIA’s false Mexico City documentation of a Communist assassination plot; a domestic political war based on the same documents seen truly, but a war the CIA would fight with every covert weapon at its command; or a complete cover-up of any conspiracy evidence and a silent coup d’etat that would reverse Kennedy’s efforts to end the Cold War. . . .
3. One of the results of the Snowden “op” was the death of the Obama/Clinton State Department’s attempted re-boot with Russia. In this regard, the actions of the Obverse Oswald are similar to the way that the painting of Oswald Red served to exacerbate Cold War tensions. The killing of the attempted diplomatic rapprochement with Russia was, in turn, central to the realization of the destabilization of the Yanukovich government in Ukraine and the installation of the heirs to Stephan Bandera’s OUN/B in the Maidan coup. The program segment details the assassination of OUN/B leader Stephan Bandera –a key part of the painting of Oswald Red. Blamed on the KGB, the killing was–in all likelihood–performed by BND (German foreign intelligence and the successor to the Reinhard Gehlen “org”) or other Underground Reich-connected elements, possibly elements of CIA. We noted in FTR #925  that the head of a broken key to Bandera’s apartment was still in the lock two years later, as Stashynsky was on trial! Furthermore, Stashynsky still had the broken-off shaft of the key in his possession, linking him to a capital crime and opening him up to “termination with extreme prejudice” by the KGB, had he actually been in there employ. Murdered on the same day that Lee Harvey Oswald “defected” to the Soviet Union, Bandera’s killing was linked to Oswald’s alleged killing of JFK by elements associated with the W.A.C.C.F.L. W.A.C.C.F.L. ele­ments dis­sem­i­nated the lie that Oswald was trained at the same facil­ity as Stashyn­sky, and that the JFK hit was part of a Soviet pro­gram of assas­si­na­tion of West­ern polit­i­cal lead­ers. It should be noted that W.A.C.C.F.L.-related ele­ments also fig­ured promi­nently in the “han­dling” of Oswald in New Orleans, Dal­las and (pos­si­bly) the Soviet Union. The disinformation that Oswald was a KGB assassin was inserted into a Senate Subcommittee report by Sen. Thomas Dodd, with assistance from elements of CIA.